Valley in Grand Staircase-Escalante National Monument, Utah, USA. (Inside Science) -- Protected areas like national parks and national monuments provide a refuge for not just a wide array of different species, but for a diversity of genes within those species, according to new research. The Trump Administration's plan to shrink several national monuments could result not just in smaller populations of animals, but in a loss of genetic diversity that could make those species less able to adapt to a shifting environment, said Coleen Thompson, who studies conservation genetics at Ohio State University in Columbus. Thompson wanted to compare the genetic diversity of species that live both inside and outside protected areas across North America. But studying such a huge area would be impossible for a single research team. “No one scientist can sample the whole world,” she said. So Thompson used a computer program to pull data from two online databases that scientists use to record and share their results -- Genbank, which holds genetic data, and GBIF, which records location data. She was able to find the right kind of data for 50 different species -- mostly small rodents like the Northern Flying Squirrel. Comparing genetic data for the populations of those species living both inside and outside protected areas, she found that around 12 percent of the populations inside a protected area were significantly more diverse than those outside and more importantly, none of the populations outside had more genetic diversity than their relatives inside. She presented her findings last month at the North American Congress for Conservation Biology in Toronto. Genetic diversity within a species – having lots of different versions of the same genes – is important because it gives a species more chances to adapt and evolve to new threats like disease or climate change. The Irish potato famine in the 1840s, for example, was caused in part because farmers relied on just a couple of varieties of potato, which were susceptible to blight. More diverse crops would have provided a better chance for some of them to resist the pest. The same goes for species in the wild. “If there is no variation in a species and it is susceptible to a disease, it could go extinct,” said Amato. The loss of biodiversity isn't just bad for the species that go extinct, it has knock-on effects for the whole ecosystem, said Thompson. The loss of wolves in Yellowstone, for example, trickled down through the food web altering the balance between predators, prey and plants until even rivers and streams changed direction. The reintroduction of wolves has started to restore some of that balance. That's why the Trump administration's plan to scale back protected areas, as it has already done with Bear's Ears and Grand Staircase-Escalante National Monuments in Utah, could have a major impact on biodiversity. Bear's Ears was cut from 1.35 million acres to around 202,000, and Grand Staircase-Escalante was cut from 1.7 million acres to 1 million. Protected areas need to be large enough, and well-connected to other protected areas, in order to maintain diversity. Shrinking them can only reduce that diversity, said Amato. “The effect on individual species will be different in different cases, but in general it can only be negative,” he said. The Trump administration's rationale for the cuts was to prevent “federal overreach” and give local and state governments more say in the use and commercial development of federal land. But the researchers and others suggest that when an area loses protection, it can quickly become compromised. 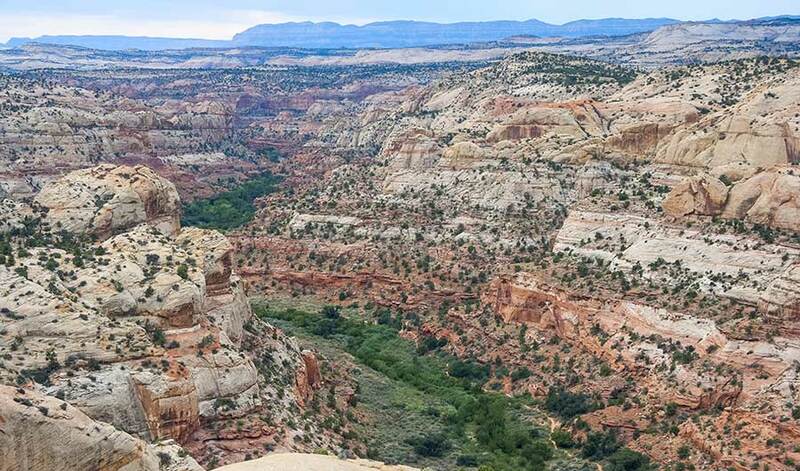 “We've already seen extractive industries move in” to the formerly protected areas in Utah, said Brad Sewell, a lawyer with the Natural Resources Defense Council in New York. The NRDC is taking part in lawsuits against the rollbacks along with other environmental groups and native tribes. Sewell, who focuses on ocean issues, is also gearing up to oppose the administration's plan to roll back protections for the Northeast Canyons and Seamounts Marine National Monument, off the coast of Cape Cod. The area is a biodiversity hotspot, with large populations of so many marine species that “we haven't even catalogued them all”, said Sewell. The NRDC, he said, will be “fighting with every tool we have” to try and maintain the protected areas, said Sewell. Increasingly, that will involve the work of researchers like Thompson and Amato to show the negative consequences of losing protection. “Now, when the challenges are greatest, the idea that it is good time to reduce protected areas makes no sense whatsoever,” said Amato.